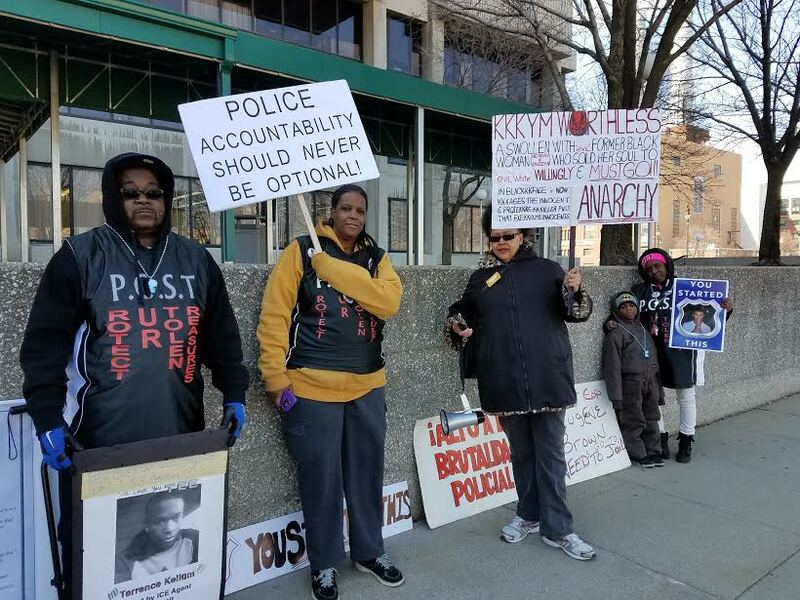 Members of Protect Our Stolen Treasures (POST) including Kevin Kellom, father of Terrance Kellom at left, call for Kym Worthy to step down in protest March 22, 2017. Worthy refused to charge an ICE agent and other police who slaughtered Kellom’s son in his home in front of his family in 2015. 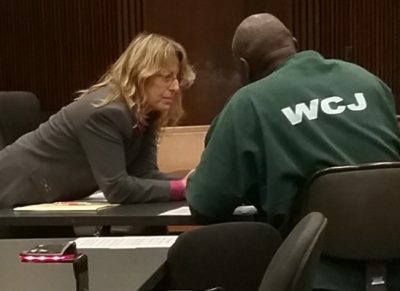 Valerie Newman talks with juvenile lifer Charles Lewis at court hearing Oct. 28, 2016. Lewis accuses her of violating attorney-client privilege. DETROIT — Wayne County Prosecutor Kym Worthy’s appointment of attorney Valerie Newman to head her office’s revived “Conviction Integrity Unit” (CIU) raises serious doubts about whether that unit, or the State Appellate Defenders’ Office, where Newman worked for 23 years, truly intend to free innocent prisoners, or most juvenile lifers. The CIU will have two full-time lawyers, a consultant lawyer, a full and a part-time investigator, and an administrative staff person, costing the County $660,000 a year, according to Worthy spokeswoman Maria Miller. But many individuals and families experienced with the original CIU, founded in 2009 to investigate hundreds of claims of falsified forensics evidence, and others experienced with Newman’s representation, disagree with the mainstream media’s positive depiction of Newman’s appointment. Worthy has recommended that Lewis and 66 other Wayne County juvenile lifers, 98 percent of them Black, be re-sentenced to LWOP, the highest number among counties in Michigan. State-wide, prosecutors have recommended LWOP for 247 out of 363 juvenile lifers, although the U.S. Supreme Court ruled that “only the rarest child” should die in prison, in Miller v. Alabama (2012) and Montgomery v. Louisiana. Lewis estimates that at least 20 percent of state juvenile lifers are actually innocent, largely due to negligent representation by court-appointed attorneys. But SADO has refused to pursue innocence claims. 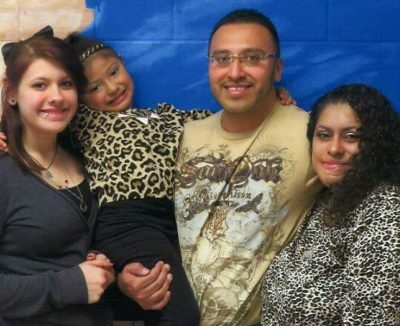 “This is just another dressed-up sham to make it appear that the true goal of the prosecutor is to confess wrongdoing by her office and Detroit Police by tugging SADO along as if to give this unit some integrity,” said paralegal Roberto Guzman, formerly of the People’s Crime Lab Task Force to Free the Wrongfully Convicted. During a July, 2017 announcement of the pending re-creation of the CIU, Worthy essentially agreed, predicting the “overwhelming majority” of convictions will stand. 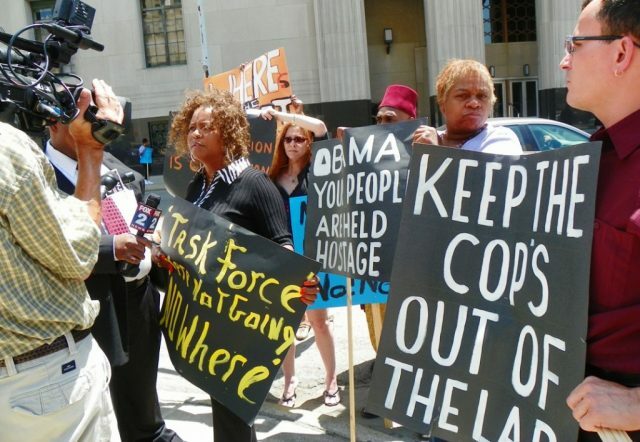 Members of the People’s Task Force including Marilyn Jordan (l) and Roberto Guzman (r) protest Kym Worthy’s initial Conviction Integrity Unit May 16, 2011, after the shutdown of the Detroit Crime Lab due to a high percentage of falsified forensic findings. They demanded an investigation independent of Worthy and the police. Only four cases were re-examined; Worthy re-convicted the defendants involved. The Prosecutor’s Office and SADO collaborated as partners in the original CIU, meant to address hundreds of wrongful conviction claims deriving from falsified forensics evidence, which resulted in the closing of the Detroit Crime Lab. But the WCPO and SADO identified only four cases involving such evidence. Worthy sent those defendants back to trial, where they were re-convicted and are again serving life sentences. 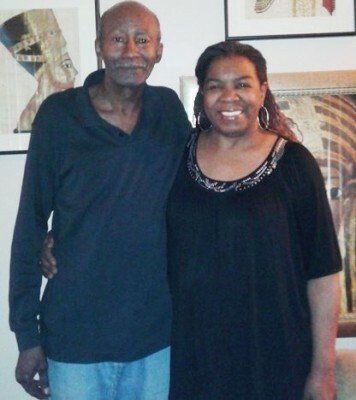 Nine clients released out of 194, nearly six years after Miller v. Alabama? In its request for a $1.4 million renewal of state funding, on top of nearly $2 million already provided, SADO estimated it would take “another five years” to complete juvenile lifer re-sentencings. That means ten years during which Michigan juvenile lifers are serving unconstitutional sentences, on top of their original unconstitutional convictions. At least six have already died in prison. SADO will not challenge two 2014 state statutes limiting the effect of Miller and Montgomery, but at least two federal cases are calling for the U.S. Supreme Court to outlaw ALL JLWOP sentences immediately, no strings attached. Atty. Deborah LaBelle has fought for the rights of juvenile lifers for decades. She also argued for the restitution of “good-time” credits, which would allow many of the state’s JLWOPer’s immediate release. She said a total of 38 juvenile lifers have been released to date, including those represented by private attorneys under the Michigan Appellate Assigned Counsel System (MAACS). MAACS was administratively merged with SADO in 2014. Approximately 75% of indigent felony appeals are assigned to the MAACS roster, while approximately 25% of cases are assigned to SADO. The U.S. Supreme Court unfortunately denied writs of certiorari Nov. 27 in the cases of Sarah Marie Johnson v. the State of Idaho, and the State of Arizona vs. Gregory Nidez Valencia, Jr. and Joey Lee Healer after its conference Nov. 21. Both cases asked the Supreme Court to ban ANY juvenile life without parole sentences. Sarah Marie Johnson, 16 when charged with killing her parents. Gregory Valencia, charged with felony murder involving bicycle theft. “Neither courts nor experts can accurately determine at the time of sentencing whether a particular child’s crime reflects ‘irreparable corruption’ as opposed to merely ‘transient immaturity,” the Fair Punishment Project of Harvard Law School wrote in an amicus brief for the Johnson case. 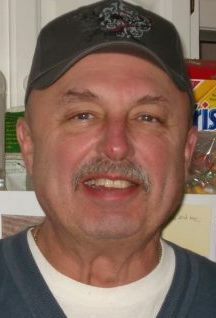 Wayne State University Professor of Law Peter Henning commented on whether Newman could face conflicts of interest in her new position. “. . . .an attorney like Ms. Newman cannot disclose confidential communications without the client’s permission, nor under Michigan Rules of Professional Conduct 1.8(b) can she use confidential client information to the client’s disadvantage,” Henning said in an email to VOD. 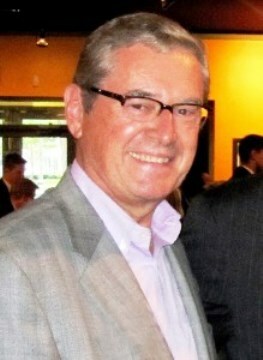 Peter Henning, professor of Law at Wayne State University. “So she would not be able to represent the prosecutor’s office in a case in which she represented a client or received confidential information that could be used to the client’s disadvantage, at least not without full disclosure to the client and permission,” Henning continued. “The appointment itself does not violate the Michigan Rules of Professional Conduct, but her prior representation of individuals could present a problem. Moreover, the usual rule is that when a lawyer is part of an organization, like a law firm, then client confidences are usually imputed to all the lawyers in the organization. Newman represented Charles Lewis as his defense attorney during multiple hearings in front of Third Judicial Circuit Court Judge Qiana Lillard in 2016. During that time and afterwards, she repeatedly violated her client’s right to confidentiality even before becoming a prosecutor. DID NEWMAN, AP COMMIT PERJURY, WITH ASSISTANCE FROM JUDGE LILLARD, IN LEWIS HEARING FEB. 15, 2017? There is abundant evidence of Lewis’ innocence. Most of the witnesses at two trials, including Dennis Van Fleteren, partner of Detroit Police Officer Gerald Sypitkowski, whose murder Lewis is serving time for, testified that they saw another perpetrator kill the officer on July 31, 1976. “When I met her, the first thing [Newman] asked me was whether I felt remorse for my crime.” Lewis said. He said he told her NO because he didn’t commit it. Newman then sabotaged Lewis’ efforts to have his case dismissed pursuant to State and U.S. Supreme Court precedents after the Court Clerk’s loss of his entire court file. She agreed to “re-construct” the file, turning over attorney-client privileged information to APA Jason Williams prosecutor on a flash drive marked www.SADO.org, as Newman and AP Jason Williams admitted according to transcripts of a Feb. 15, 2017 hearing. 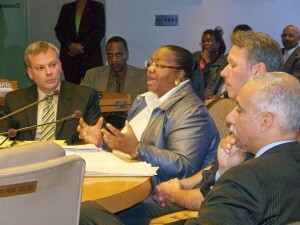 Judge Qiana Lillard supported their testimony. 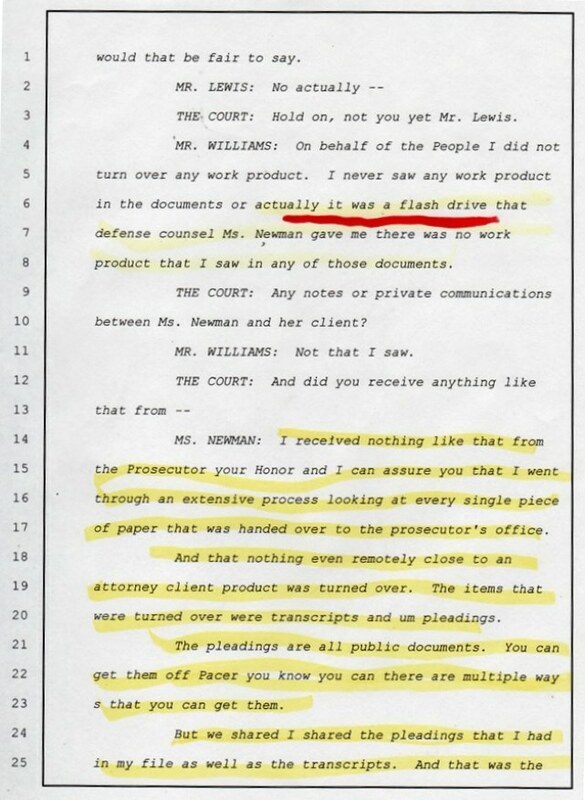 THAT TRANSCRIPT, COMPARED WITH A LIST OF THE ITEMS ON THE FLASH DRIVE, OBTAINED BY VOD, SHOWS THAT NEWMAN AND WILLIAMS LIED UNDER OATH, LIKELY COMMITTING PERJURY, IN STATING THAT THE FLASH DRIVE CONTAINS NOTHING BUT PUBLIC DOCUMENTS. Other pertinent pages of the transcript, in which Judge Lillard supports Williams’ and Lewis’ testimony, can be read at http://voiceofdetroit.net/wp-content/uploads/CL-transcript-2-15-17-selection-2.pdf. In fact, the flash drive contains the following items listed in its index, including attorney-client communications, medical records client never authorized to be given to anyone else, in violation of HIPAA, and a personal autobiography originally in a folder marked by Foley & Larder, “DO NOT GIVE TO ANYONE ELSE. The flash drive, however, does not include an appeals opinion by Third Judicial Circuit Court Judge Deborah Thomas dated Aug. 6, 2006. 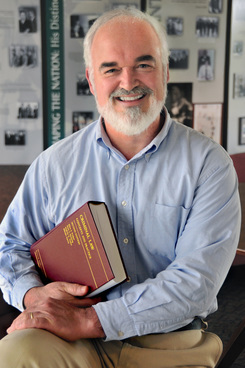 Thomas’ opinion notes among other matters that Thomas “thoroughly read” the missing first trial transcript and concludes that Recorders Court Judge Joseph Maher dismissed Lewis’ first jury unconstitutionally, which should have meant an acquittal with double jeopardy attaching. VOD first reported on this opinion after discovering it in the file kept by Judge Lillard. Lewis has adamantly contended that he received that opinion ten years late from corrections personnel. They confirmed its validity with an employee of the Wayne County Clerk’s office, who discovered that had been mis-filed. Newman withdrew from Lewis’ case without filing an appeal of a crucial Nov. 11, 2016 order by Judge Lillard, which denied both Lewis’ motion for dismissal and Newman’s motion for 40-60 years, leaving only the prosecutor’s LWOP motion. Newman then undermined Lewis’ relationship with subsequent attorneys by claiming he was guilty and giving them the flash drive. The flash drive includes a frank autobiography he gave to Foley & Lardner attorneys, which contains information prejudicial to Lewis regarding other events, but not relevant to any role by him in the murder of Officer Gerald Sypitkowski. It is the epitome of “attorney-client privileged” information. Although a second copy is present in the file boxes much later on, Newman/SADO moved this copy up to the front of the file list on the flash drive. Defaced copy of Drain order. Inkster cops, AP Karen Plants, and Judge Mary Waterstone. The roles played by Valerie Newman, Jason Williams, and Judge Qiana Lillard in this case bring to mind similar allegations that resulted in the convictions, disbarment and retirement of another Wayne County Judge and AP in a drug bust case in 2005. Wayne County AP Karen Plants conspired with Inkster police to allow them to lie under oath about the true nature of a witness in the drug bust, who was in fact a paid informant. Judge Mary Waterstone presided over the case and was apprised of the perjured testimony but allowed it to take place. Plants was charged with perjury and spent six months in prison, while Waterstone faced misconduct chages and retired early. Attorney General Bill Schuette brought the charges against the players in that case. 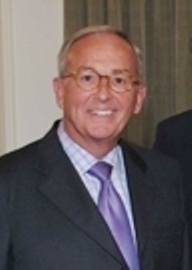 In another case VOD has covered, that of Clifford and Mary Stafford, Newman was assigned to represent Mary Stafford on appeal, while her husband was represented by another attorney, Ian Kierpaul. 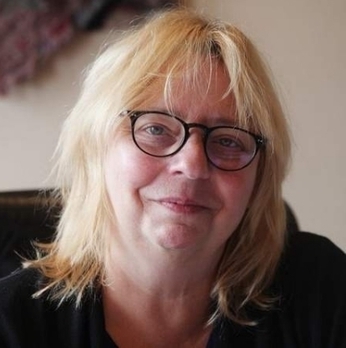 Mary Stafford, at the age of 66, had been sent to the Huron Valley Women’s Prison Feb. 16, 2016 for 1-10 years by Wayne County Circuit Court Judge Michael Hathaway, on charges of “false pretenses” and “obstruction of justice,” brought by the County’s Mortgage Deed Fraud Task Unit. Her husband was sentenced to probation. The County claimed Wells Fargo had asked for the prosecution, but Wells Fargo firmly denied that. The Michigan Department of Corrections probation report on Mary Stafford noted that she had taken care of her six younger siblings growing up, never been convicted of any offense, and made only $700 a month in Social Security benefits. That report recommended an 18-month sentence of probation. Stafford also took care of her sister after she was shot in the head and paralyzed, various children and grandchildren, and was a “latch-key” caregiver for neighborhood children when the family lived on Gilchrist. During the appeals process, Newman first held a “post-conviction” hearing in front of Hathaway without the presence or knowledge of her client, on Aug. 26, 2016, an ethical violation. 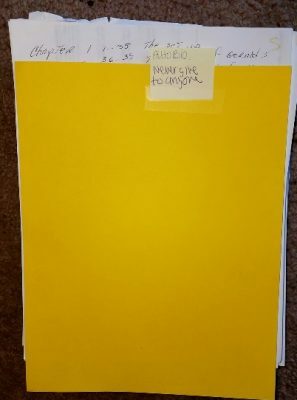 A transcript of the hearing demonstrated Newman’s utter lack of knowledge regarding what had transpired at the Staffords’ trial, although Newman had postponed ANY action on Stafford’s appeal for months until she obtained all the transcripts of the trial. Judge Hathaway made wild allegations as he had during the trial, but Newman could not defend her client, and lost the hearing. 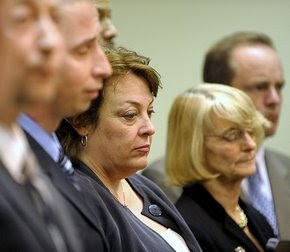 The actual appeal filed by Newman did not even make an innocence claim, ignored numerous instances of judicial and prosecutorial misconduct during the trial that were cited by the husband’s attorney in his appeal, and accused the husband and a friend of being responsible for the alleged crimes. Newman did not ask to make oral arguments at the Appeals Court hearing, although she showed up for it. A joint opinion denying the appeals by both Staffords was rendered. Newman sent Mary Stafford a copy of her appeal. She said that concluded SADO’s representation, leaving Stafford owing over $75,000 in court fines, allegedly to be paid to Wells Fargo. However, SADO’s website says its attorneys practice in the highest appellate courts, including the Michigan and U.S. Supreme Courts. Fortunately, the MDOC paroled a thoroughly traumatized Mary Stafford after one year on Feb. 16, 2017, with the parole to end in February, 2018. 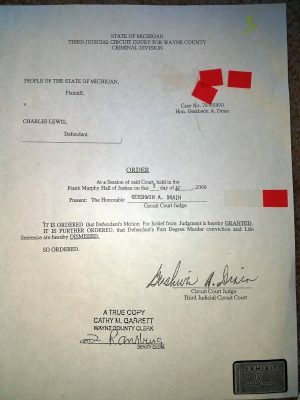 Full opinion by Judge Deborah Thomas on Charles Lewis case at http://voiceofdetroit.net/wp-content/uploads/DThomasOpinion2.pdf/.